Voicemail transcription service for BlackBerry Storm | BlackBerry Blast! 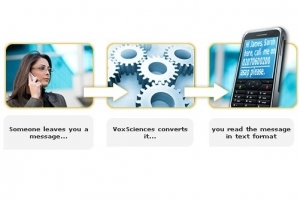 VoxSciences is offering a free trial of their Voicemail to Email service. The voicemail transcription service transforms the Blackberry Storm into a fully functioning message centre, giving users unsurpassed control and management of their voice message options. Instant Test - Anyone can TEST the voicemail to text transcription service simply by dialling 020 7050 5000 from a mobile phone, recording a message and receiving a text message back 3 minutes later. For a one month free trial of the full Voicemail to Text service visit voxsci.com.